Thank you for choosing to make D’Artagnan a part of your Thanksgiving holiday. In our effort to always deliver the highest quality products and experience, we've compiled answers to some of the most frequently asked Thanksgiving questions, along with links to seasonal recipes, articles and cooking tips to help you navigate your way through the holiday. Read this article to learn more about all our holiday birds and decide which one is best for your table. We also have a helpful video in which Ariane describes the different birds available. 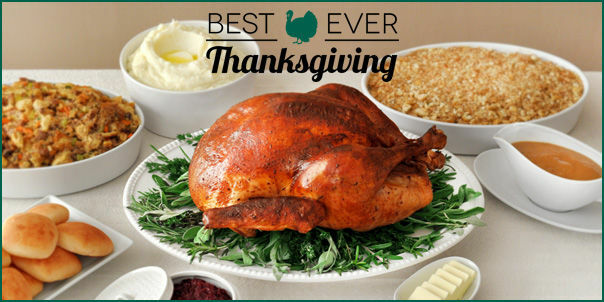 We work with small farms to offer fresh birds specifically for Thanksgiving. Because of the limited quantities and extreme demand for these products, fresh holiday birds must be "pre-ordered" well in advance of the holiday. Fresh turkey, fresh goose and fresh capon will be available for pre-order (while supplies last) from Monday, October 22 to Noon EST, Monday, November 19. Orders not containing a pre-order product may be delivered on any available day in the next 30 days. Regardless of your delivery day, our Fresh Turkeys, Turkey Breast, Goose and Capon for 2018 will have a "use or freeze by" date of Monday, November 26. Therefore, whenever possible, we strongly urge you to have your Thanksgiving orders and pre-orders delivered on Friday, November 16 or Saturday, November 17. If orders do not contain pre-order products, we suggest delivery even earlier if/when possible. Choosing Tuesday, November 20 as your delivery date leaves little to no ability for D'Artagnan to fix problems or send a replacement in the event there is an issue with your delivery, delays with FedEx or other issues out of our control. See our Holiday Delivery Calendar for more information. Upon delivery, unpack and inspect your holiday order. Fresh, perishable products should be kept under refrigeration until it's time to cook. We recommend keeping products in the coldest part of the fridge, or in a cooler packed with ice. Our turkeys do not have pop-up timers in them. You can purchase one for a few dollars at a grocery store, but we prefer to use a meat thermometer. They are more precise, and you are less likely to overcook the bird when using a thermometer. Download and print our Turkey Roasting Guide for a quick reference. Option 1: Protect the skin by rubbing with fat (butter, duck fat). You can also sear the skin to help lock in juices by starting the bird in a 450° or 500° degrees F oven for the first 30 minutes, then reducing the oven temperature to 325° or 350° degrees F for the duration of roasting time. Conventional slow roasting is done at 325° or 350° degrees F for the entire duration. If a particular recipe calls for a specific temperature, there is usually a reason, but for searing, the hotter the better, and for general oven roasting both 325° and 350° degrees F are appropriate temperatures. Proper and frequent basting will keep the meat from drying out. Baste a big bird at least every 20 minutes, and smaller ones about every 15 minutes. Option 2: Buttering beneath the skin (i.e. black truffle butter) is another technique, and this one actually helps the bird to self-baste. Start this bird in a preheated 500° degrees F oven, cook for 30 minutes to sear in juices, then reduce the oven temperature to 325° or 350° degrees F for the remainder of the cooking time. The butter will melt into the meat making it moist and flavorful, as well as brown and crisp the skin, leaving the delicious bits of black truffle just beneath the surface. It’s not necessary to baste this bird. Option 3: Cloaking with butter-soaked cotton cheesecloth is a technique especially good for a heritage turkey. Fold and trim a sheet of cheesecloth to create four layers large enough to drape and cling to the contours of the entire breast. Stack the four layers together and saturate in a basting mix of melted, unsalted butter and stock or a good, dry white wine, or a basting mix of your choice, and then drape the cloth over the bird. Brush the entire bird (over the cloth as well) with the basting mix. Start this bird in a preheated 450 degrees F oven, cook for 1 hour, basting regularly, and then reduce the oven temperature to 350 degrees F for the remainder of the cooking time. As soon as you have accumulated enough juice in the pan for basting the whole bird, use it instead of the basting mix. In the last hour of cooking, take the bird out of the oven and remove the cheesecloth, and then return the bird to the oven so that it can brown while it finishes cooking. You should continue to baste about every 20 minutes. If you're looking for additional help or recipes as you prepare your capon or turkey, we suggest starting with our Roasted Capon Cooking Guide or Roasted Holiday Turkey Cooking Guide. For those of you making a ham or roast for the holidays, consider browsing our Holiday Hams & Roasts Collection which includes our popular Bone-In Smoked Ham and Spiral Ham, both made from Berkshire pork with all-natural ingredients. Why not? This traditional one-pot meal of preserved duck meat, pork, sausage, and beans is the very soul of traditional Gascon cooking. Our signature Cassoulet Recipe Kit is classic comfort food that serves 12 people and creates a convivial meal, making it a perfect alternative to turkey. It is also available in a smaller size that serves 4 people. Learn the history of this classic dish and how to host a cassoulet dinner party. Our fresh suckling pigs are ideal for entertaining a crowd, at the holidays or anytime. Be sure to select the correct size suckling or roasting pig – one that fits your cooking method: grill, oven, rotisserie or roasting box, and the size of your party. You should allow for 1 ½ pounds of pork per person. If you don’t have a place to dig a pit or have a specialized implement like La Caja China, suckling pig can also be cooked in a high-heat oven. Just be sure you have an oven of a size that can accommodate the pig you are purchasing. Suckling pigs that weigh less than 20 pounds generally fit in the average kitchen oven. Anything larger needs a spacious grill or smoker.